With her daughter’s and son-in-law’s arms around her at their home in Waterdown, Ontario, Betty peacefully left this world to be with her Lord on Friday, January 11, 2019, in her 92nd year. Betty was the wife of the late William Kilganon (Bath), loving mother of Kenneth (Nancy) Banfield, Heather (Jake) Zwart, Holly Martin (deceased) (Bruce) and Larry Banfield; grandmother of Nathan (Brandi) Banfield, Laura Banfield, Kendra (David) Walcott, Andrew (Stephanie) Zwart, Daniel (Elizabeth) Zwart, Michael (Lydia) Zwart, Peter Zwart and Jennifer Martin and great-grandmother of Jake and Sophie, Harvey, Georgia Rose and Samuel, Jake, Elisabeth and Heather-Joy. Predeceased by her siblings and their spouses, Don and Carm Priest (Kingston), Philip and Lorraine Priest (Toronto), Kenwin Priest (Scarborough) and Reg and Dorothy Rowe (Napanee) and niece Kathy Agaolu. Remembered by many nieces and nephews, extended family and friends. Betty grew up as one of five siblings on a farm just outside of Bath, entering the working world at the age of 12 as a telephone exchange operator, studying to complete high school on her own. She often mentioned Mr. and Mrs. Young of Bath as such wonderful people. As a nurse (RNA), Betty worked in the WAVES, Kingston hospital and London tuberculosis sanitorium before taking her mother to see her mother’s sisters on the trip of a lifetime by boat back to England. During her time with the Air Forces she married and had 4 children, single-handedly shepherding them across the ocean for a 2 year stint on the Forces base in Baden-Solingen Germany. The family returned to Canada and set up home in the County on the current farm in West Lake. 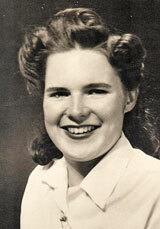 When the marriage ended, Betty continued to care deeply for her children, instilling work habits and respect for others, while herself working many jobs – nursing at Picton, Belleville and Trenton hospitals – often holding second and third jobs at the West Lake Canning factory, food preparation in small restaurants, local farm assistance and taking in seniors to help other families meet their care needs. Betty was so grateful for the help of Glenise Holmes who became a lifelong friend. And the family were grateful that someone was trying to help mom. Eventually Betty also tried her best to care for a brother’s four children. After these long hard years, Betty met and married her childhood sweetheart. Mom met and challenged life while living with undiagnosed mental illness and severe migraines. These two enemies played havoc with all of her relationships. As dementia took more of mom from us, Mom was more clearly comforted by the grace extended by Christ, seeking more often forgiveness and giving apology for the pain caused. She took great joy in the music of the heart, in gladioli and cosmos (those are flowers by the way) and was still able to respond to the great hymns, keeping in time, on tune and still whispering many of the words in her last weeks. Always seeing and serving the needs of the helpless, Betty was least likely to care for herself or for those who could care for themselves. In lieu of flowers, taking time to serve a needy individual or family would be the gift our mother would ask of you. The family received friends at the Paul G. Payne Funeral Home, 178 Main Street, Odessa, Ontario K0H 2H0 on Saturday, January 19th from 11am-12pm. A Graveside Service followed at Wilton Cemetery.